It’s hard to believe, but 2014 marks the final year of Vernon Wells’ 7-year/$126 million dollar contract. Originally inked just over seven years ago, the deal made Wells the richest player in Toronto Blue Jays franchise history. Now the contract which was once the bane of the existence of the J.P. Ricciardi era will finally come to an end this coming season. It’s officially the end of an era, even though the contract and Wells himself left town long ago. The contract truly encapsulated the free-spending ways of the early days of Rogers ownership of the Blue Jays, as Wells’ contract was just one of many high-dollar deals on the Blue Jays roster. That doesn’t bode well when the player signing the deal even things the organization is off their rocker for giving him to a 7-year contract extension. At the time, Vernon Wells’ 7-year/$126 million dollar deal was the sixth largest in baseball history. Wells was coming off his best season, a 5.7 win season by FanGraphs standards and the second 30 HR/100 RBI/.300 AVG campaign of his career. Like many players before him, Vernon Wells inked his contract extension immediately following his best season, and his performance steadily declined afterwards. Ultimately, the Blue Jays paid for 2006-like results, and what they received was anything but. The funny thing is most pundits viewed the Vernon Wells contract as a good deal for both the player and the Blue Jays. At the time, no one was really crying foul as Wells was poised to make $20 million per year as a free agent following the 2007 season anyway. Alfonso Soriano’s 8-year/$136 million dollar contract and Carlos Lee’s 6-year/$100 million dollar deal set the precedent for free agent outfielders just one month prior in November of 2006. So at an annual average value of $18 million dollars, Vernon Wells’ contract wasn’t all that egregious and was actually on par with others inked around that time period. However, it didn’t take all that long for the Vernon Wells contract to become a burden on the Toronto Blue Jays payroll. Wells very quickly became the poster boy for the ill-fated albatross contract. Two months into his brand new deal, Wells suffered a left wrist fracture and played just 108 games that season. The ill effects of his wrist injury were felt the following season as well, as his power took a sharp decline in 2009 despite playing an entire season. To demonstrate just how dramatically Vernon Wells power numbers fell off from 2009 compared to 2006, his slugging percentage tumbled 142 points (from .542 to .400), and his home run total was cut in half (from 32 to 15). So with that in mind, it didn’t take long for Vernon Wells’ contract to rank up there among the worst in baseball. It’s high average annual value and total years combined with Wells’ lack of production made it one of the most unappealing deals in all of MLB. At the time, I remember there being a lot of contempt from the Blue Jays fanbase directed towards Vernon Wells. It wasn’t necessarily because Wells was one of the worst players in baseball, it was because he was being paid like he was one of the best. Spearheaded by Ricciardi or Ownership? 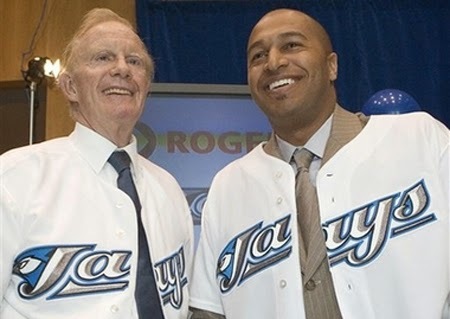 It has long been rumoured that the Vernon Wells contract was not spearheaded by J.P. Ricciardi, but rather by President Paul Godfrey and Toronto Blue Jays ownership. That certainly makes sense, as the team payroll increased dramatically from $45.8 million in 2005 to $84 million dollars in 2007. In fact, the news of Wells’ contract came mere months after Ted Rogers announced the Blue Jays would increase payroll. The previous offseason, the Blue Jays signed free agents B.J. Ryan and A.J. Burnett to sizable contracts at a total of $102 million. So much like the current Blue Jays regime, the window for contention back then felt like it was rapidly closing. In a vacuum, the Vernon Wells contract didn’t make all that much sense. But given the set of circumstances, J.P. Ricciardi may have felt he was handcuffed and had to lock up their apparent franchise player to a long-term deal. We’ll never know for sure if ownership influenced Vernon Wells’ contract extension or not, but one has to assume the front office had a heavy hand in it. While the dollars per annum still seems incredibly high, it’s the contract length that’s the most perplexing part of the deal. Why did the Blue Jays feel the need to give Vernon Wells seven guaranteed years? Were they afraid Vernon’s hometown Texas Rangers were going to pony up a sizable contract, and they needed to blow any potential counter-offers completely out of the water? The Blue Jays cleverly back-loaded the final four years of the seven year deal; the first three years would technically only account for $24 million of the total contract, while the final four years would balloon to $89 million. So the way the contract was constructed, the Blue Jays were technically able to secure Wells’ services at a fairly low salary for the first few years, and were hoping his production early on would pay for his incredibly inflated salary later down the road. It wasn’t until late 2009 when the wheels were actually set in motion to find a more cost-effective replacement for Vernon Wells. 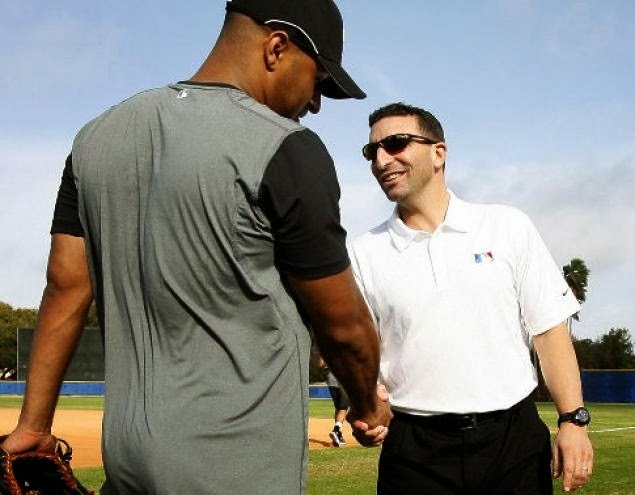 Alex Anthopoulos reportedly attempted to acquire Anthony Gose in the Roy Halladay trade in December of 2009, but failed to do so. Prior to that, the Blue Jays didn’t really have any centre field prospects in the pipeline, so locking up Vernon Wells was really the only viable option, and his contract extension solidified the position of centre field for many years to come. AA eventually got his man the following year in a subsequent trade with the Houston Astros to acquire Anthony Gose in exchange for first base prospect Brett Wallace. Arguably, that was the beginning of the end of Vernon Wells’ time in Toronto. In retrospect, I don’t blame Vernon Wells for his contract, I blame ownership and management. It was their idea to sign him to a 7-year extension, and Wells would be silly not to take that kind of guaranteed money. For whatever reason, they deemed it necessary to overpay in dollars and years to keep Vernon Wells in a Blue Jays uniform for an unnecessarily long time. In their 36 year history, the Toronto Blue Jays are guilty of letting a lot of incredible players get away: Jeff Kent, Chris Carpenter and Carlos Delgado just to name a few. But Vernon Wells is one that they probably should have let walk out the door. 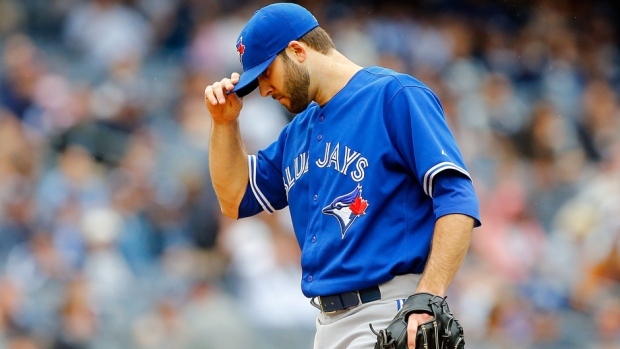 Thankfully, Alex Anthopoulos proved that virtually no contract is untradable. He somehow managed to unload close to $90 million remaining on Wells’ deal, and actually received a few players in return (Mike Napoli and Juan Rivera) from the Los Angeles Angels. It was right place at the right time for the Blue Jays as the Angels seemed overly desperate to acquire an outfielder. They missed out on signing Carl Crawford, and Vernon Wells was the next best option. Armed with a highly-touted centre field prospect now in their system in the form of Anthony Gose, the Blue Jays were happy to oblige. Vernon Wells may be long gone from Toronto, but the impact of his contract extension is still being felt within the current Blue Jays regime. Wells’ contract not only was long in duration, but it essentially gave him all the control. Vernon had a no-trade clause, an opt-out clause, performance bonuses built in, and seven guaranteed years with no buyout or club options. 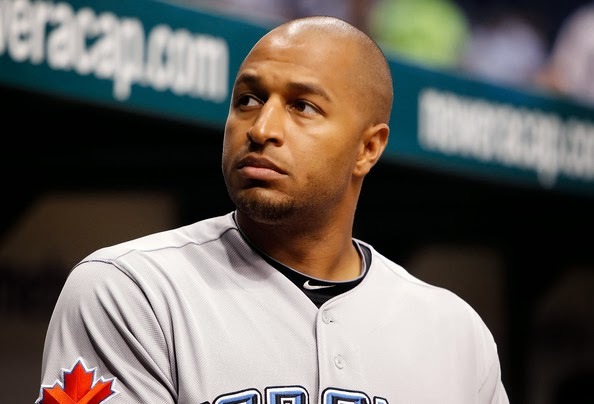 In fact, Vernon Wells may be the very reason why Anthopoulos instilled a “five year policy” in the first place. So in that respect, Wells’ contract is the antithesis to any subsequent multi-year contract delved out by the Toronto Blue Jays. Since taking over as General Manager in 2009, Alex Anthopoulos has not signed a single contract which included performance bonuses, incentives, player options, no-trade clauses or opt-out clauses. After the Vernon Wells contract, the dynamic has shifted within the organization. No longer do long-term contracts allow players to have most the control; contracts are now structured much differently. Also, the timing of any significant contracts given out by the Blue Jays no longer takes place at the height of the player’s value. Anthopoulos has done a great job of locking up guys like Jose Bautista and Edwin Encarnacion to team-friendly deals. Most contracts are now structured with some sort of exit strategy like club options, whereas Vernon Wells’ deal left the Blue Jays at the mercy of his decision to opt out or waive his no trade clause. It was a lesson learned by the Toronto Blue Jays organization, and an expensive lesson at that. One which they surely won’t repeat any time soon. 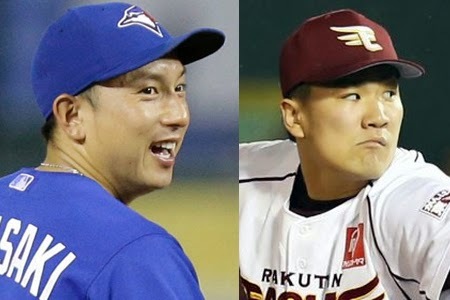 Could Kawasaki Be the Key to Signing Tanaka?